In Sweden, officers of the Swedish Security Service have arrested a person who worked “in a high-technology sector” and is believed by investigators to be a Russian agent. "This individual is suspected of having been recruited as an agent by a Russian intelligence officer who was working under diplomatic cover in Sweden," Daniel Stenling, the Swedish Security Service Head of Counter-Intelligence, said in a statement. The Swedish tabloid Dagens Nyheter first reported the spy bust. Kremlin spokesperson Dmitry Peskov did not comment on the arrest and instead redirected an inquiry to Russia's Foreign Ministry. Its embassy in Sweden has not made public remarks. Still no comment from Russia, beyond those remarks by Peskov, at noon on Thursday in the United States. Video footage that appears to show the suspect led out of a restaurant by 'Säpo' (Sakerhetspolisen) officers is circulating on Swedish media, as the BBC reported. 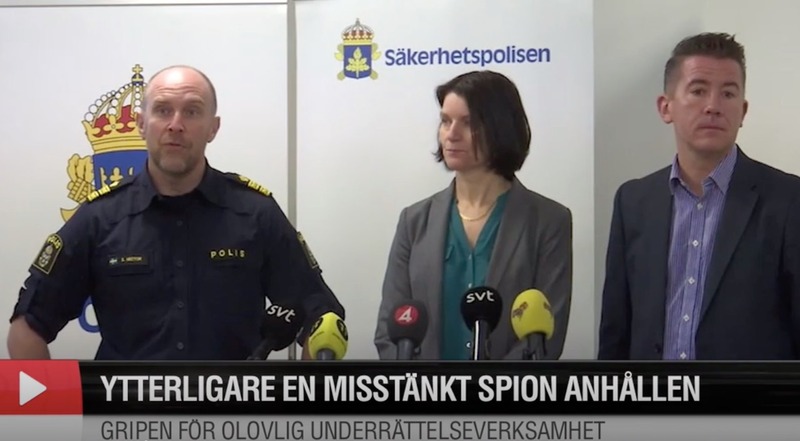 A witness quoted by Swedish newspaper Aftonbladet said several officers of the Swedish security police, known as Sapo, stormed the restaurant and surrounded a table where two people were sitting having a meal. Swedish media said a second person was also detained in the operation but later released after claiming diplomatic immunity. Here is the Swedish government's news release about the arrest of the suspected Russian agent. An individual has been arrested on suspicion of having carried out unlawful intelligence activities against Sweden. A criminal investigation into this matter, headed by a national security prosecutor, is being run by the Security Service. The individual in question was arrested with the assistance of the Swedish Police in the evening of 26 February 2019 during a meeting in central Stockholm. “This individual is suspected of having been recruited as an agent by a Russian intelligence officer who was working under diplomatic cover in Sweden," explains Daniel Stenling, Head of Counter-Intelligence at the Swedish Security Service. The Service has been carrying out intensive intelligence and investigative work in this matter for a long time: it is suspected that the criminal activities have been going on since 2017. The arrested individual was working in a high-technology sector in Sweden on tasks known by our Service to be the type of intelligence sought after by foreign powers. “The threat to Sweden is greater than it has been for several years. Technological developments have made state actors’ efforts to gather intelligence in cyberspace more sophisticated. At the same time, the more traditional intelligence-gathering approach, using recruited agents to collect information, is still being used. This combination enables state actors to broaden and deepen their collection of classified information,” says Daniel Stenling.